Aluminium windows, windows and doors in extruded aluminum. Security is a pre-requisite to feel safe in one's home or in the workplace. However, the cases of apartments and houses that are burgled with significant damage occur ever more often. Most burglaries in private homes are committed during the day, in fact at that time the majority of people are not at home; however, the opposite is true for businesses, since they are mainly empty at night. Recent research has proven that a burglar generally breaks into a home through French windows and windows, mostly using occasional tools to break the glass or try to break the frames. As one might guess, then traditional door and window frames do not assure protection from intrusions and, as a consequence, do not assuage the fears of home-owners. To oppose greater resistance to the burglar's actions,it is therefore advisable to install burglar-proof door and window frames, specifically designed to also meet security requirements which are ever more important today. 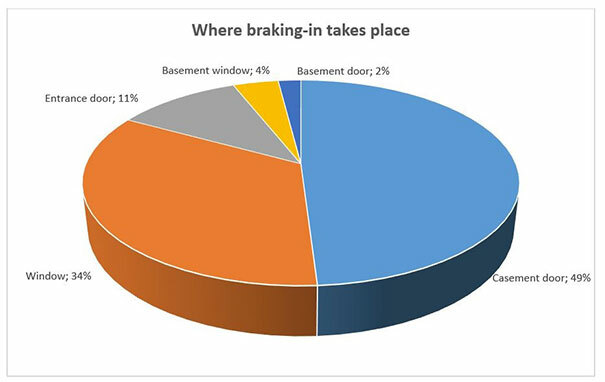 Where does braking-in take place? According to the statistics, more than 80% of housebreakers go through the window or French door and not, as erroneously believed, the front door of the home..
How does the intrusion take place? Housebreakers only need rudimentary tools to unhinge a window quickly. Almost 70% of break-ins are carried out with a screwdriver, with blade width varying between 6 and 12 mm.